This article examines the problem of understanding historical responsibility in the context of historical perspective. The author questions what makes responsibility historical, in which ways responsibility can be written into a chronology and how the meaning of responsibility should be understood. Based on Agamben’s reconsideration of Pilate’s trial of Jesus, an analysis of the origins of contemporary dualism in understanding the responsibility of the metaphysical perspective of an unchanging semantic value and the variability of the requirements of contingent situations for the execution of an act is carried out. In addition, the article examines the relationship of responsibility for the past (primarily constituted through the prism of guilt and memory) and responsibility for the future as viewed in an instrumentalist vein and in the context of messianism. Historical responsibility can be conceptualised on the basis of an ontological approach to understanding responsibility (Heidegger, Levinas, Derrida, Nancy), according to which the connections of responsibility are not limited to imputations of obligations to recognise guilt, but rely on the fundamental basis of human activity. With this method of consideration, the historicity of responsibility does not lie in the localisation of certain events on time intervals, but rather is seen as the unfolding of the meaning of human deeds, thanks to which people, actions, intentions and ideas are organised into a single historical perspective. Historical relationships of responsibility are not limited by the time, space or social status of people, but are tied by the finitude of the existence of those whom they bind. Daria Tomiltseva is Associate Professor of Social Philosophy of the Institute of Social and Political Sciences at Ural Federal University. Her principle research interests are forgiveness, reconciliation, peace, ethics, sociality, historical responsibility, moral responsibility. Agamben, G. (2015). Pilate and Jesus. Stanford: Stanford University Press. Agamben G. (2009). Theory of Signatures. In Agamben G. The Signature of all things: on method. NY: Zone books. Arendt H. (2006). Eichmann in Jerusalem. London: Penguin books. Derrida J. (2005). On Forgiveness In Derrida J. On Cosmopolitism and Forgiveness. London and New York: Routledge. Duncan P. J. S. (2000). Russian Messianism: Third Rome, Revolution, Communism and After. London: Routledge. Erlich S.E. (2016). 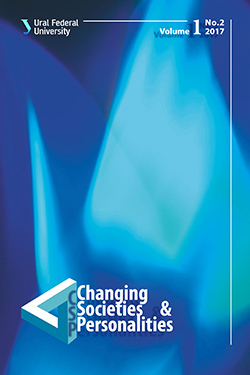 Global Memory of the Information Society: Ethics, Identity, Narrative. Historical Expertise, 3, 11-32. Frank P., Nezhyba J., Heydenreich C. (2006). Taking Corporate Social Responsibility Seriously. Ekologický právní servis – Environmental Law Service, Brno. Global Memory: a Culture of Historical Responsibility in the 21st century. (2016). Historical Expertise, 3, 7-10. Guibernau M. (2008). National Identity versus Cosmopolitan Identity. In D. Held, H.L. Moore and K. Young (eds.). Cultural Politics in a Global Age, 148-156. Oxford: Oneworld. Green M.J. (2002). Institutional Responsibility for Global Problems. Philosophical Problems, 30 (2), 79-95. Jimerson C.R. (2007). Archives for All: Professional Responsibility and Social Justice. The American Archivist, 70, 252-281. Johnson G.F., Michaelis L., ed. (2013). Thinking Justice after Marion Young. Toronto: University of Toronto Press. Merkel W. (2008). Democracy through War? Democratization, 15 (3), 487-508. Miller A. (2016). The Politics of Memory in Postcommunist Europe and its Impact on the European Culture of Memory. Polity, 1, 111-121. Pakhlyuk K.A. (2016). Global Memory Culture: in Search of a Teleological Perspective. Historical Expertise, 3, 33-49. Raffoul F. (2010). The Origins of Responsibility. Bloomington, Indianopolis: Indiana University Press. Victory-70: the Reconstruction of the Anniversary (2015). Ed. Gennady Bordyugov. Moscow: Airo-XXI.